First, congrats to the Bama coaches and players on a great victory. I really thought this would be a tough game for a few reasons. First, I saw MSU play earlier this year and saw that they had a physical defense. Second, also after watching I saw their QB throwing the ball better than he did earlier in the year. Probably my biggest reason for thinking this would be a close game was it was the next game after an always physical game vs LSU. OFFFENSE: Bama had their lowest output on offense for the year. They had 305 total yards with 142 rushing and 163 passing. 156 of these yards came on the first 2 drives of the game. As for negative plays, I have Bama with 5 tackles for losses, 4 sacks, 2 fumbles one which was lost, and an interception. The none call on one fumble was huge as Bama scored on that drive. Bama had 3 three and outs with 1 coming in the first half and 2 in the second half. The offense had 9 pass plays that covered 10+ yards and 7 running plays that covered 10+ yards. The longest run of the day was 17 yards and the longest pass completion for the day was 25 yards. Bama got into the red zone 4 times scoring 3 touchdowns and turning the ball over on downs on the last trip. Many people wonder why not kick the field goal at that point, but there are reasons to go for it. First, a field goal can be blocked and turned into a quick score and that benefits the other team getting the quick score. Two they are down by 24 and you are making the team drive the length of the field if you don’t score with little time on the clock. Bama’s field goal came from outside the red zone as it was a 49-yard field goal. QB: Tua was under pressure a lot of the day. As you saw above, he was sacked 4 times. He had to complete throws under pressure. Tua did miss a couple of throws that he usually makes. I also think there were a couple of balls that are usually caught that were not this game. I do think the MSU player made an asserted effort to go low on the tackle that took Tua out of the game. If you watch it looks like he intentionally went low and launched his lowered head toward the injured leg. Jones came in and did well enough with the lead Bama had. He did miss an open receiver and the receiver had some open ground if he had caught it. RB: Jacobs had a big game. He showed both is power and vision while running the ball. It is hard to believe he was a 3-star athlete coming out of high school. Harris ran well and did a very good job picking up the blitz. The problem is MSU were sending more than they could block all the time. N Harris ran well, but I think they kept him out later because of the injury from last week. Rec: I Smith had 5 catches and Jeudy had 6. I Smith had the most yards of any rec. Three of Smith's catches were on the first 2 drives. I have read complaints about the receivers being held, but it is hard to see on the view on TV. I do know on the replay on TV it showed Jeudy had a case for being held on a play. OL: This was a great game to test the OL. MSU had a very good defensive front. They did get a good push early in the game. I do think they were a little confused on a couple of blitzes as well as MSU just bringing more than Bama could block. I did wonder why Bama didn’t max protect at times. I did notice that MSU would have some read blitzes where if the back released and they came off the blitz. There was one play were Leatherwood blocked inside and Willis blocked out leaving the inside guy free to the QB. Many times this depend on how many people are outside the tackle and the assignment of the running back. Def: The defense played a good game. MSU had 169 yards of total offense which included 44 rushing and 125 passing. I do think Bama was aided by some drops by the MSU receivers. Bama gave up a total of 65 yards in the first half and 38 of that came on the run where Bama missed some tackles as well as a 23-yard completion. Fitzgerald was averaging 104 yards rushing a game and was held to negative 23. As far as negative plays I have Bama credited with 8 tackles for losses, 5 sacks, and 1 fumble recovery which actually happened on special teams. I have Bama credited with 6 three and outs, 3 in each half. For plays that covered 10+ yards, MSU had 4 pass plays and 2 running plays that covered that distance. MSU got into the red zone once and turned the ball over on downs. They should have had a touchdown as MSU was called for a phantom block in the back that negated the touchdown. Bama busted coverage twice in a row and it didn’t hurt them because of the penalty for delay of game. DL: They played well. Their may not have been as much pressure with a 4-man front as there was last week, but they did have numerous tackles for losses. They again kept the OL off of the linebackers so they were free to make tackles. 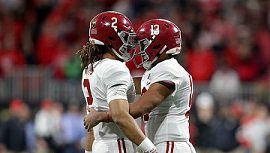 The early games this year where Bama was allowed to play numerous players is playing off as many more plays are being made by the depth of the DL. LB: I thought they had a good game. MSU has a mobile QB who can run and throw which puts bind on the LB’s. They read the game well and made some big plays in both the running and passing game. Wilson blew up the RB on a sack which helped keep MSU off the board when they got into the red zone. DB: They busted coverage a couple of times and it should have cost Bama a touchdown. However, I mentioned the phantom block in the back and the delay of game that kept MSU off the board. Overall, they played well most of the game as MSU only had 125 total yards passing. Special Teams: One of the best games for the special teams. A 49-yard field goal should help the confidence of the kicker. I still think his plant foot needs adjusting at time as well as his alignment. Kick-off coverage was good, and Jacobs opens the game with a good kickoff return. Surtain made good play on the punt which may have been touched by Waddle and could have been a turnover. They also did a good job covering the punt down on the 1-yard line, something they missed last game. Penalties: Officially Bama had no penalties, however the kick out of bounds allowed MSU to have better field position. MSU had several penalties, many in crucial situations. Finally, this would be a good week to get healthy. This was back to back physical games, especially on the offensive side of the ball. It would be great to get a big lead early and allow others to play and finish the game. Also, if my memory serves me correctly, Bama defense has allowed only 3 trips in the red zone in the last 2 games. I had to go back and add the receivers as I left them off the first time. It may be a good thing that we were tested like this with a formidable defense like MSU had. If we make it that far, Clemson's D is just as stout. This should put us in a position to well prepared for them. We had very good early success running against MSU, then it suddenly ended. Many people suggested it was because Brown was injured and Cotton replaced him. Maybe, but at about the same time the MSU defenders switched schemes, and Josh Jacobs said MSU defenders were calling out our plays, especially stretch plays, based on our alignments. Thanks coach! Care to comment further on the apparent targeting of Tua's knees? Is that coached or do players do that on their own? That is a difficult question to answer. There are coaches who would do that, however, there are players that do many things on their own. I should have given Jacobs a little more props. He had, 97 rushing yards, 12 receiving yards and 27 return yards for a total of 136 yards. You can all give your opinions, but I can't tell for certain what the defender is doing. I could be convinced that he's aiming for the ball; trying to knock it out. I could believe he's trying for the knee, but he's inept if that's the idea. He might be lower than intended because he bounces off his own player, and then Tua's right arm pushes him lower. Just glad it wasn't worse. It's football, and being rough/tough is part of it. Good analysis hscoach. I thought this would be a dog fight as well. LSU and MSU back to back is a tough physical demand. Hopefully Bama can get some guys rested and more healthy for Auburn and UGA.